District Legal Services Authority, Sivasagar. 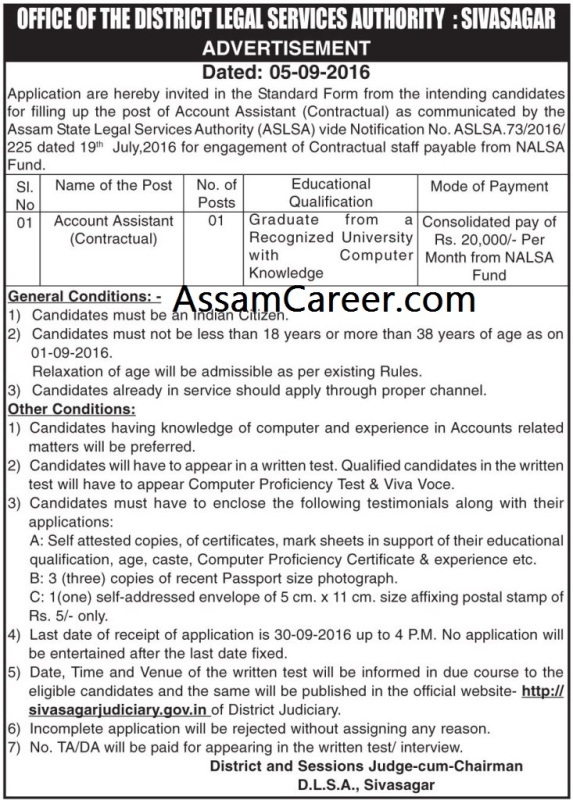 Applications are hereby invited in Standard Form from the intending candidates for filling up of the following contractual posts under District Legal Services Authority, Sivasagar. Age: 18 to 38 years as on 01 Sept 2016. Selection Procedure: Selection test, Computer Proficiency test & Interview. How to apply: Candidates must provide the following documents along with the Standard Form of application: certificate and mark sheets in support of educational qualification & computer proficiency, age, caste, experience, three copies of recent passport size photographs, and a self addressed envelope of 5 cm * 11 cm affixing Rs 5 postage stamp.